There is nothing worse than having purchased that expensive, or long awaited fish, either from a shop, or auction. And find the bag the fish is in, isn’t sufficient, or worse, springs a leak! 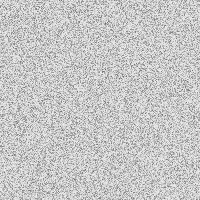 Here is something we put together for our own use, and found it came in handy a few times. Just carry it with you in the glove compartment, or in your polybox, etc. *All bag sizes are approximate. “Bag Buddies” are no longer available, so there is a limited number of these packs available which contain the “Bag Buddies”, and once they’ve gone, they’ve gone. •	By Reducing stress & calming the fish. •	Promoting a slime coat on the fish. •	Releasing oxygen into the fish bag. •	Reducing Ammonia build up. Full instructions on how to use the “Bag Buddies” will be given in each Pack. One tablet is sufficient for up to 1 (US) Gallon of water, and can be broken into smaller pieces for smaller volumes of water. The “Little Hottie” heat pack can be used once only, and instructions will be given in each Pack. The mini elastic bands can be used to either close the fish bags, or, if the fish are small, then you can use the bands to round out the fish bag corners, so you don’t accidentally trap the fish. It is also advisable to carry the bag upside down, so the bag remains rounded for the welfare of the fish. If closed correctly, the bag will not leak. The fish bags have been selected so that if you need to double bag, then the small will fit inside the medium, the medium will fit inside a large, or a large into a large. 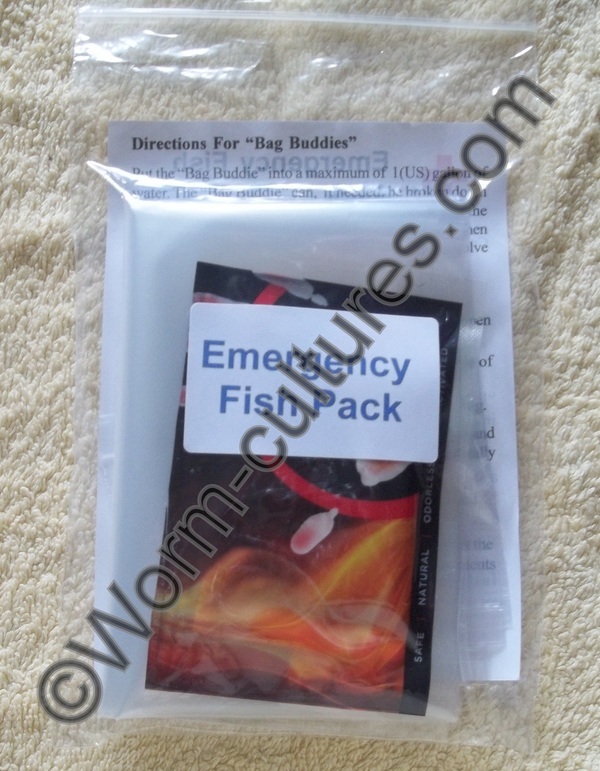 The contents of the “Emergency Fish Pack ©” are contained in a zip lock back. The “Bag Buddie” and elastic bands are also contained separately in small zip lock bags. 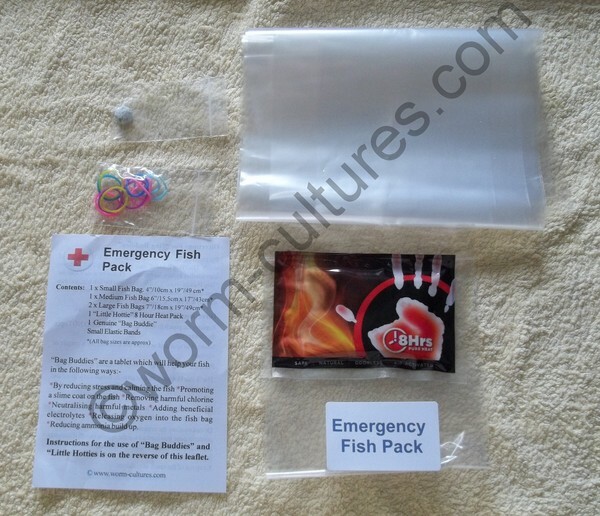 The “Emergency Fish Pack ©” will be posted to you 2nd class.